At our next meeting we welcome Steve Edwards who will tell the story of Rowland Vaughan of Newcourt, his pioneering water meadows and complicated private life. The illustrated talk takes place at the New Bridge Community Centre on Thursday November 29th at 7.30pm, admission £2 to include coffee and biscuits. Everyone welcome. 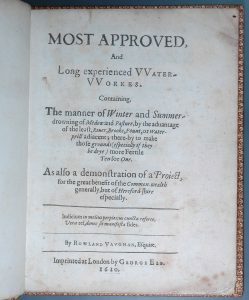 Rowland Vaughan (1559–1629) was an English Manoral Lord who is credited with the introduction of a new irrigation system that greatly improved the grass and hay production of meadows through a system of periodic “drownings”. It was one of the many new methods introduced during the British Agricultural Revolution that increased crop yields and allowed for the development of large cities.